Interruptions or inconveniences are nothing new. Rarely does a day go by as planned. Life is filled with inconveniences and interruptions. We can’t just quit because things get inconvenient. Our plans are constantly thwarted by forces beyond our control. The list is long and ever-changing: Sickness. Conflict. Traffic jams. Forgetfulness. Appliance malfunctions. Rudeness. Laziness. Impatience. Incompetence. The list goes on and on. What we have is a hard time seeing past our side of the inconvenience, to the other side of the inconvenience (God’s side). We may think the inconvenience has no purpose other than to discourage us, make life more difficult, and thwart our plans. However, inconvenience could be God’s way of protecting us from some unseen danger, or it could be an opportunity for us to demonstrate God’s grace and forgiveness. It might be the start of something even better than we had planned. Or it could be a test to see how we respond to adversity. Whatever it is, even though we may not know God’s reason, we can be assured of His motive—to make us more like Jesus and to further His kingdom on earth. 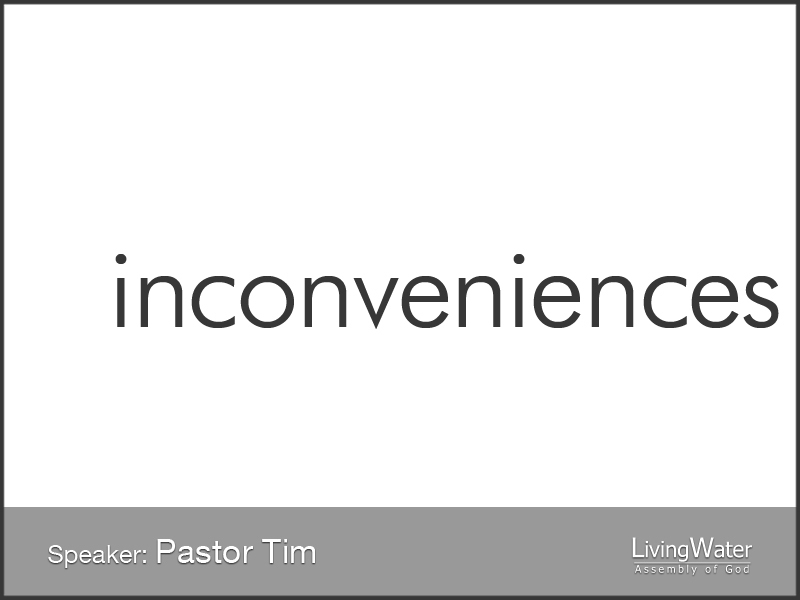 To say that God’s followers throughout history have been “inconvenienced” would be an understatement. [Joseph, Paul…] I just read the book of Acts this February (a chapter a day; 28 days=28 chapters). The beginnings of the Church was anything but convenient. But God had a purpose. Knowing this, we can thank Him, being confident that He is giving us an opportunity to redeem the time. So often it is the little things in life that get to us, and there seem to be so many of them. Whenever we are tempted to lose our tempers, blame others, of just give up, we need to rely on the Holy Spirit to put a melody in our hearts. What happens to us is not nearly as important as what God does in us and though us. Hebrews 6:11-12, And we desire that each one of you show the same diligence to the full assurance of hope until the end, 12 that you do not become sluggish, but imitate those who through faith and patience inherit the promises.